Jürgen Klopp has brought much to Liverpool since becoming the manager but the one thing the German still cannot achieve is momentum. His team arrived here looking for a third straight victory but instead lost for a second time in four games, with the pain for those who filled the away end intensified by the identity of the man who delivered the killer blow. Andy Carroll has waited three years to score against his former club, making no secret of his frustration at not succeeding at Anfield having arrived there for £35m in January 2011, and he finally delivered. It was classic Carroll, a soaring, expertly directed header that had the ball nestling in the far corner of the net. 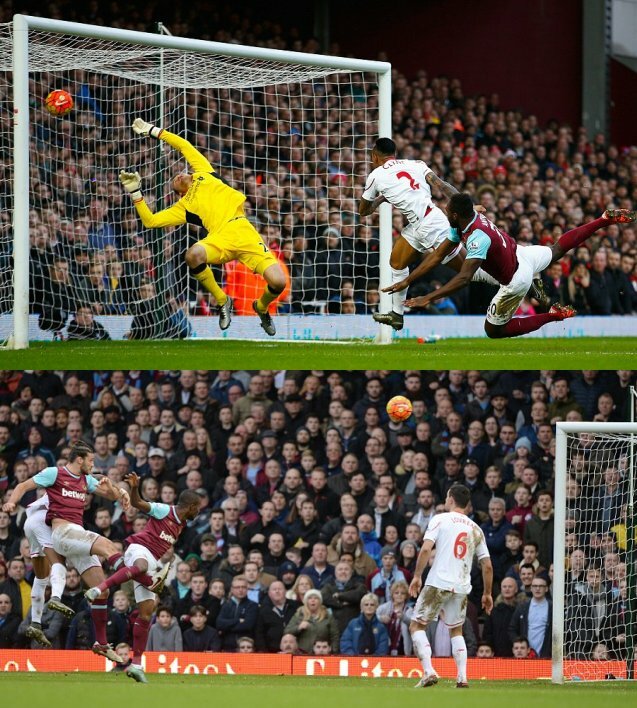 The No9�s revenge followed another fine header from Michail Antonio after 10 minutes, and the win not only moved West Ham ahead of Liverpool into sixth but also completed a league double over the Merseyside club for the first time in 52 years having triumphed at Anfield in August. West Ham�s performance was full of energy, endeavour and no little skill, and for Klopp there was no hiding his fury with his side at their failure to build on victories over Leicester City and Sunderland and instead revert to the lacklustre, sloppy outfit who were beaten 3-0 at Watford before Christmas. Klopp went on to say Liverpool �always had the ball�, which while stretching it was not completely barmy given they had 65% of possession. As he intimated, Liverpool showed flashes of their capabilities either side of the interval when they threatened with slick, purposeful play, most notably via Emre Can�s shot in first-half stoppage time that rattled the bar. But all too often, and not for the first time this season, their passing broke down and they lacked penetration. Operating again as a lone forward Christian Benteke delivered another display that makes Liverpool�s decision to spend £32.5m on the 25-year-old in the summer appear a mistake. The Belgian was too often static and did little or nothing when presented with a chance to strike, most notably early on in the second-half, and with the score 1-0 to West Ham, when he wafted half-heartedly at Alberto Moreno�s cross. The comparison with Carroll was stark. The 26-year-old was a constant nuisance to Liverpool�s back four with his aggressive, muscular approach and he put them to the sword on 55 minutes, running on to Mark Noble�s cross and, having got a jump on Nathaniel Clyne, sending the ball past a rooted Simon Mignolet for his third goal of the season. Another header shortly after forced Mignolet into a save and, overall, this was a fine afternoon for a player deemed not good enough for Liverpool having become, and remaining ahead of Benteke, their most expensive signing to remind his former employers of what they let go. There were other standout performers in claret and blue, such as James Collins and Manuel Lanzini, who almost scored with a wickedly swerving shot that hit the post before he was substituted with what appears to be a reoccurrence of a thigh injury and is likely to be out for up to six weeks. Dimitri Payet came on as a second-half substitute having been out of action for two months with an ankle injury. The Frenchman, so brilliant following his arrival from Marseille in the summer, could well end up taking Antonio�s starting place, although the 25-year-old may take some shifting having scored his second goal in successive games. It summed up West Ham�s show of desire and ruthlessness that the opener came via a counterattack that started with Antonio winning the ball from Moreno by his own area before sprinting up the pitch to meet Enner Valencia�s cross. �The situation with Alberto was a foul but we reacted not right. We have to avoid this cross,� said Klopp, who by the end was watching proceedings from underneath his hood on what was a wet and grey afternoon in east London. The weather summed up his mood as well as the bleakness of Liverpool�s top-four hopes.